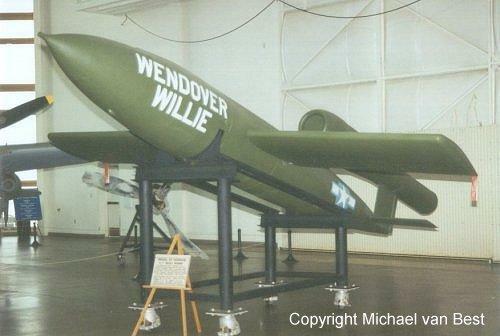 In July 1944, the U.S. Army Air Force had the opportunity to inspect the remains of a crashed German V-1 (Fieseler Fi 103) cruise missile, and within weeks decided to mass-produce an exact copy of the weapon as the JB-2. The first JB-2 test vehicles were built directly by the USAAF at Wright Field, but in 0ctober 1944, a JB-2 airframe production contract was awarded to Republic while Ford was to build the JB-2's PJ31-F-1 pulsejet engine. However, most JB-2s were actually built by Willys-Overland under subcontract from Republic. The JB-2 was almost identical to the German V-1, except for the launching method and (in later missiles) the guidance system. Because the pulsejet only worked efficiently in forward flight, the missile had to be boosted into the air. The Germans used a steam catapult, but this was considered as too dangerous by the USAAF. Several techniques were tested, and one solution was to propel the JB-2 along a ramp with the help of a solid-propellant rocket booster. Until the end of 1944, the majority of launch attempts failed, but by early 1945 the launch problems were essentially solved. In May 1945, a zero-length launch system (the first of its kind in the US) was developed, and tested very successfully in 97 launches until the end of July. The zero-length launch option triggered the initial Navy interest for a submarine-based version (see KGW-1/LTV-2 Loon below). A few JB-2s were also air-launched from modified B-17 aircraft. The German V-1 and the original JB-2 used a very primitive guidance method, in which the pulsejet was stopped after a preset time leading to a dive of the missile on the target. Because this was extremely inaccurate, the USAAF began to test a radio-command guidance in early 1945. The JB-2 was equipped with a radar beacon to facilitate tracking, and a remote control operator could send guidance commands for course corrections and to initialize the terminal dive. While significantly more accurate than the original system, the average error was still 400 m (1/4 mile) at 160 km (100 miles) range under optimal conditions. Loon became primarily a launch test vehicle to test and evaluate procedures for firing guided missiles from submarines, and was again redesignated as LTV-2 in September 1947 and finally as LTV-N-2 in early 1948. 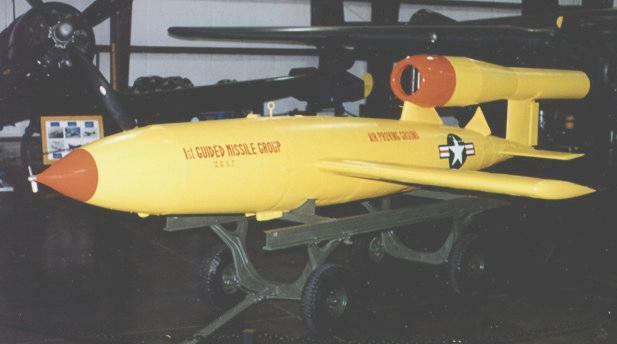 The LTV-N-2 program was terminated in March 1950, and some of the results were used in the development of the SSM-N-8/RGM-6 Regulus cruise missile.